... 1970 (40 years ago today), in the course of 4 hours, 4 airliners en route to New York were hijacked in Europe's skies. Passengers thwarted assailants on 1 plane. Nearly 400 passengers on the other 3 planes were being held in "different locations in the Middle East," and the hostage-takers, affiliated with the Popular Front for the Liberation of Palestine, were demanding the release of 3 persons jailed in Switzerland. 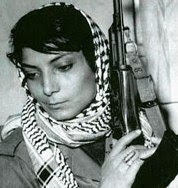 Most hostages would be released on September 11 of the same year; the final 6 would be freed on October 1 in exchange for Leila Khaled (right). (photo credit) Born 2 decades earlier in Haifa, Khaled had been arrested on the 1st plane, in the course of her thwarted attempt to reach the flight deck while grenade-armed. Her life's the subject of a 2006 documentary.